In 2005, 12-year-old John Heslin sat in a restaurant in Athlone with his family. He spotted Dessie Dolan at a nearby table and shyly asked for an autograph. Westmeath had famously won the Leinster title the previous year and Dolan was Heslin's hero. Little did he know that in six years he too would be lining out for Westmeath and rooming with Dolan. That encounter back then was a moment that left a mark on the aspiring young footballer - and one he still thinks of often. Heslin has been a senior inter-county footballer for eight years and, even though there has been no championship silverware, his motivation remains undiminished. 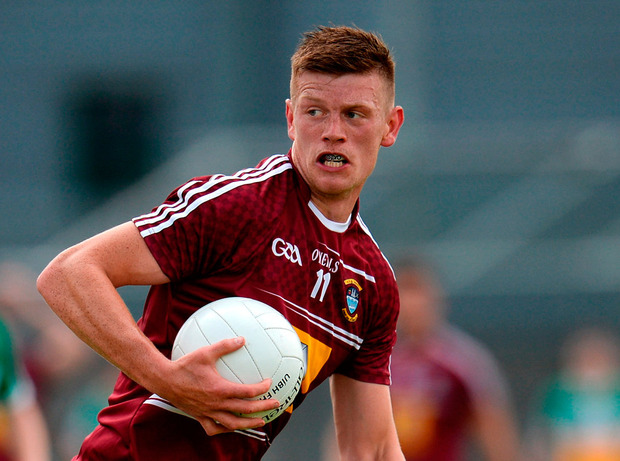 For Heslin, playing for Westmeath has a deeper meaning. "I'm proud to be a Westmeath footballer and knowing that there are kids out there who look at the team and see us the way I saw the 2004 team when I was growing up is a huge motivator," he says. "It's unbelievable to have people looking up to you and it makes me want to keep on playing. "I love playing inter-county football, it's a game I'm hugely positive about. There has to be something more there than the carrot of just winning, because when you aren't winning all the time it can be hard to find the motivation to keep playing and giving so much." The 26-year-old has dreams of walking up the steps of the Hogan Stand on the big day. In 2015 and 2016 they reached the Leinster final but were beaten on both days by a phenomenal Dublin team. "I'd be lying if I said getting beaten by 20 points isn't disheartening. You have to be realistic too, it was a credit to the management to get to a Leinster final and maybe in another year we may have won one, but we came up against a team who are arguably the best team to play the game and are favourites to win this year and do five in a row. We still live in hope that we will do it some day." Heslin is a busy man. As well as football he has a job with MSD Animal Health, a PhD to complete and a farm at home to help out on. There aren't enough hours in the day. "This is my ninth year playing senior inter-county football in the first team and I'm only 26. I was straight in from the word 'go'. I won't ever look back and regret it but I think when you get to a certain amount of years of inter-county football you start looking elsewhere and you want to do other things. "The days of a man or woman putting in 14 or 15 years at inter-county level are decreasing year on year. It will suit some professions, or if someone is living close to where all the training is on, but I think in general inter-county careers will get shorter. "There are lots of positives to working and playing GAA though. When I'm out talking to vets they have a huge interest in the GAA so it breaks down barriers at work and lots of people involved in the company are from GAA backgrounds." In 2011, Heslin dipped his toe into the world of professional sport when he joined the Richmond Tigers in Australia, but he quickly realised a life in the AFL wasn't for him. "There is very little room to manoeuvre in a professional set-up because that is your job, but it is an enjoyable one. "The commitment levels here in football aren't far off now. We are doing all the same things in terms of training, strength and conditioning, preparation, video analysis, nutrition. "It's all very similar, the one big difference is the money and the rest. Lads will head to training during the week in Athlone, then drive back to Dublin, getting home at 11 or 12 and we are one of the lucky teams. We are in the midlands so we aren't too far from Dublin. Other counties are much further away. But we are all there because we want to be." With his thesis due for submission this year, Heslin opted out of football for a few months but rejoined the panel for the league. They face Longford today, very much in contention for a return to Division 2. "One of the reasons I came back when I did was because I enjoy the league so much, and I didn't want to miss it. Playing teams at our own level week in, week out is very enjoyable. The question then leads to whether or not a tiered championship should be introduced, and I think it could be a runner. When you see how much the interest has grown in the league over the years, it's exciting because it's competitive. "It would be very important to get the structures right and make sure that there is still interest maintained in the second tier because I see what happened with the hurling, and outside the top tier people around the country don't really know what's happening. The focus is just on the top tier. That would be a worry for me down the line."